On November 12, 2009, the Center for Constitutional Rights (CCR) filed a case challenging Congress’s unconstitutional defunding of the Association of Community Organizations for Reform Now (ACORN). The case charges Congress with violating the Bill of Attainder provision in the U.S. Constitution, violating the Fifth Amendment right to due process, and infringing on the First Amendment right to freedom of association by targeting affiliated and allied organizations, as well. CCR attorneys say members of Congress violated the Constitution by declaring an organization guilty of a crime and punishing it and its members without benefit of a trial. On December 11, 2009, the Honorable Nina Gershon, United States District Judge for the Eastern District of New YorkJudge granted a preliminary injunction to stop Congress from singling out a single organization for punishment without proper investigation or due process. On December 17, 2009, CCR filed new papers asking the judge to amend her decision to include new provisions in the budget passed on December 13 and signed into law by the president on December 16 that attempt to de-fund ACORN once more. On January 12, 2010, CCR files new Declaratory Judgment and Preliminary and Permanent Injunction. On February 9, 2010, CCR files Reply Brief to the Government in support of our motion. On March 10, 2010, Judge Gershon grants CCR's motion for Declaratory Judgment and Preliminary and Permanent Injunction. On March 17, 2010, the Government appeals the judge's ruling to the 2nd Circuit, and also moves for a Stay. On March 26, 2010, CCR files Opposition to Motion for Stay. On March 31, 2010, Judge Gershon denied Government's Stay Motion. On March 31, 2010, the Government filed a Motion for Stay with the 2nd Circuit. On April 1, 2010, Judge Lynch of the 2nd Circtui grants a temporary stay for the Government. On April 5, 2010, CCR files a motion in Opposition to the Stay. On April 20, 2010, parties made oral arguments in front of a three-judge panel of the 2nd Circuit. On April 21, 2010, the 2nd Circuit panel grants the Government's motion for stay. On May 14, 2010, CCR filed its Appellees Brief in the 2nd Circuit. On May 21, 2010, several amicus briefs were filed in support of CCR's Appellees Brief. On June 24, 2010, the 2nd Circuit will hear oral arguments from CCR and the Government. On August 13, 2010 the 2nd Circuit unanimously reversed CCR's USDC Bill Of Attainder victory in ACORN. The court found ACORN had standing but no bill of attainder claims. They sent the case back to the District Court to look at First Amendment and Due Process violations. On February 22, 2011 CCR filed a Petition for Cert with the Supreme Court. Click here to read it. The plaintiffs are ACORN, the ACORN Institute, and the New York ACORN Housing Company. The suit is ACORN v. USA and was filed in federal court in the Eastern District of New York. Read the entire most recent press release regarding the results of this complaint with this link. 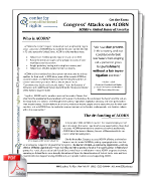 ACORN v. USA factsheet. ACORN was targeted as part of an extreme right-wing agenda against progressive organizations working for open social change and justice for poor and working class Americans (individuals who have been consistently disenfranchised and excluded from the political and economic system). The media campaign to destroy ACORN – orchestrated by political forces that have persistently defamed ACORN and similar community groups and social justice organizations – led several members of Congress to accuse ACORN of being a criminal enterprise. Download a PDF of the entire ACORN v. USA factsheet. Bill of Attainder Factsheet. A Bill of Attainder is a legislative act that punishes a specific individual or group without a trial or judicial hearing. Out of a concern for due process and the separation of powers, the United States Constitution expressly forbids Bills of Attainder, whether at the federal or state level. In U.S. history, six acts of Congress have been overturned because they were determined by the courts to be Bills of Attainder. 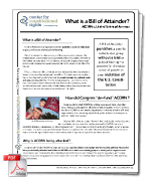 Download a PDF of the Bill of Attainder factsheet. Conservative media figures including Glenn Beck, Rush Limbaugh, Bill O'Reilly, and Newt Gingrich have called for an investigation of ACORN's activities and its supposed link to President Obama and Democrats, often while spreading misinformation about ACORN. However, these same media figures opposed or downplayed investigations into scandals involving the Bush administration, including the controversial firing of nine U.S. attorneys in 2006, the outing of the identity of Valerie Plame, and alleged torture and prisoner abuse by U.S. officials. Read more at the MediaMatters website. In separate interviews, Fox News hosts Bill Hemmer and Greta Van Susteren allowed Rep. Darrell Issa (R-CA) to attack the Association of Community Organizations for Reform Now (ACORN) on the grounds that in 1999 and 2000, one of its leaders embezzled from the group. However, at no point did either Hemmer or Van Susteren note that in 2008, the National Republican Congressional Committee (NRCC) stated that its treasurer had embezzled more than $600,000 from the organization over the course of several years. Read more at the MediaMatters website. From Brave New Films, this clip shows that Fox "News" personalities are pushing an agenda that is dangerous to ordinary Americans. Using tactics such as placing individuals singled out for censure on a blackboard and linking them to murderous dictators like Josef Stalin, Fox News has deliberately created an atmosphere of hysteria that they have used to attack organizations and individuals fighting for the issues that matter most to working families.